When the holiday season starts to overwhelm me, rearing its stressful little head into an otherwise enjoyable December, I sometimes have visions of Santa sending me my own elf. An elf who is friendly and kind, and who might rub my feet and prep the kitchen for my upcoming baking apocalypse so that the baking is enjoyable, rather than chaotic. I think we can all agree there will be no Magic Baking Elves appearing in my kitchen or yours anytime soon, but I think I can help a little by giving you some suggestions and strategies to prepare yourself and your kitchen for the inevitable. Start with the cupboards, refrigerator, and freezer. Categorize the food, and make sure all your baking goodies are in one spot for easy tracking. I actually have a baking cabinet – everything from flour and sugar to nuts (in airtight containers) to chocolate chips and sprinkles lives here. As you organize, keep a list of inventory. Nothing stinks more than spending a ton of money on Christmas sprinkles, only to realize you had 3 jars of them in the back of the cabinet at home. Check expiration dates on packages and jars. If it’s getting close to the use-by date and you don’t see yourself using it, put it in a box to go to the food bank immediately. Take this chance to organize your canned goods by “genre” – soups, tomatoes, beans, etc. Remember that certain flours (like whole wheat) can go rancid if left in the cupboard too long. It won’t hurt you if you bake with it, but it will give the baked goods an overly bitter taste. If you aren’t sure, pitch it and buy a new bag. Store it in the freezer so it’ll stay fresh for longer. Don’t forget the spice rack! While old spices won’t hurt ya, they lose their punch after about a year. If you don’t remember when you purchased said spice? Probably time to pitch it and buy a new one. Think about purchasing them from a specialty spice store instead of the grocery store. They’re fresher, so more pungent, and you can actually use less. Reorganize the drawer or cabinet so that the spices you know you’ll be using for the season are up front: cinnamon, ginger, allspice, pumpkin pie spice, apple pie spice, cloves, and nutmeg are all prominent this time of year, so keep them up front for easy grabbing! The dreaded tupperware drawer is last. I seem to have a Tupperware monster, the Sock Monster’s twin. No matter how many sets I buy, I seem to end up with containers with no lids, and lids with no containers. Donate what you can or find other uses, and then get some new (maybe disposable, seasonal for giving away?) matching bottoms and tops. Now that the kitchen has been cleaned, reorganized, and we’re rid of everything we can’t use for this holiday baking season, it’s time to restock. I’ve made a list of what I consider the absolute essentials to have on hand for a marathon of baking. Sugar: I like to keep bountiful supplies of all sugar types – granulated, powdered, light and dark brown sugar, sparkling sugars in festive colors for decorating, and also Truvia Baking Blend for a few diabetic or waistline-friendly treats. 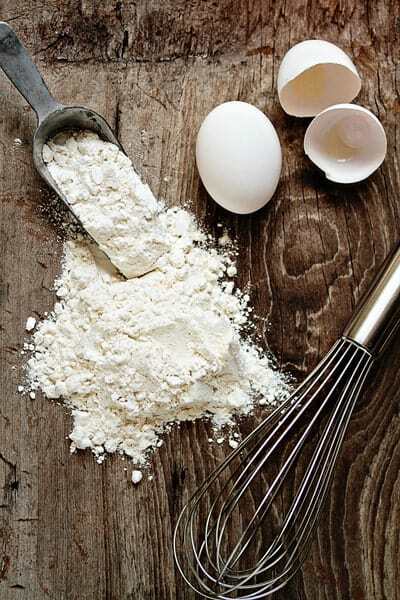 Leavening Agents: Now is the time to refresh the ingredients that make our cookies and cakes what they are. Refresh your baking soda and baking powder before you get baking and realize that one of them has lost their chemical reaction while waiting around in the cupboards. Baking Chips: Chocolate, both milk and semi-sweet, is a given. But make sure you also have white chocolate, butterscotch, and even toffee chips on hand. Of course they can be used in cookies, but they’re also handy for making ganache, or a quick cookie glaze. Fruits & Nuts: More often than not, the extra special something in a cookie is the fruit, nut, or seed you add to it. From golden raisins to dried cherries, dried cranberries, to almonds, pecans, walnuts and sunflower seeds, it’s important to have fresh bags of these on hand for tossing in at an inspiration’s notice. Milks: Most holiday favorites like fudge, cheesecake and custard-based pies (think pumpkin or chess pie) call for evaporated milk, sweetened condensed milk, or heavy whipping cream. Pick up a couple cans of the first two, and remember that heavy whipping cream has a pretty long shelf life so long as it isn’t opened. Grab a pint or two with the latest expiration date. You’ll thank me when you don’t have to run out to the store at the last minute for just heavy cream. Pumpkin: I think you know by now my obsession with pumpkin. I don’t consider it a Fall-only food, so I keep on baking with it throughout the holiday season. Have a few tins on hand. If anything, you can make a delicious hearty Pumpkin soup to go along with and decadent Pumpkin Brownies. Fresh Cranberries: This is the only time of year you can get fresh cranberries, but they freeze absolutely beautifully. They give a sweet-sour POP to anything you’re baking, so make sure you pick up a few extra bags and toss them in the freezer. Come June, when you still want cranberry walnut muffins for Sunday breakfast, you’ll be able to have them! Phase Three: Get your bake on! Here are some holiday recipe favorites around my house. From my house to yours, Happy Holidays! Now let’s get baking. If I got a chance to sit on Santa’s lap, I’d tell him I’ve been very good and I wish for a magic elf to help me in the kitchen!! Oh, how wonderful that would be. My elf would be most helpful washing dishes. I just made 8 flavors of chocolate truffles, which meant 8 very chocolate filled bowls, that need cleaned. Help, me Santa! Great tips! I just bought a couple bags of cranberries – I’m glad I did! Really liking your blog – only recently found it, but can see me spending a lot of time here! Can you please post the recipe for the caramel thumbprints cookies shown in this article? They look amazing! 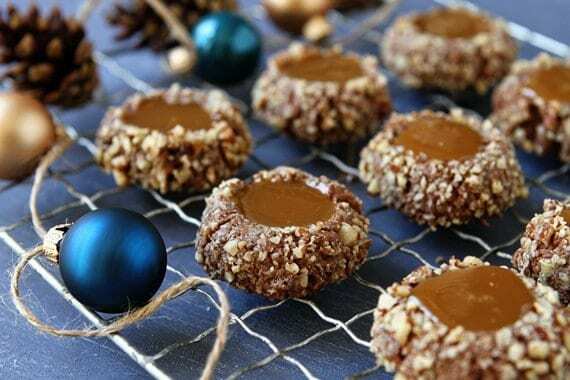 Where can I find the recipe for the Caramel Thumbprint Cookies you have pictured? They look wonderful! Thanks for the great tips! Great tips! I am so loving cranberry season!! I am going to freeze some bags myself!! Thanks for taking the time to put together those tips. I had to laugh at the one about the sprinkles–so true! Amazing ! I just love baking even if i mess up or do not eat the cakes actually. Organization sure is a determinant of successful baking. It is like having to prepare chemicals in a laboratory, missing one of them or adding more or less than required may completely destroy an experiment. I am definitely going to re organize cupboards and the fridge, the shelves and everything ! And going to grocery for shopping for the musts you have listed is just an exciting idea ! Keep on sharing your tips. thank you for posting your recipe. you really are a big help like me that I am a beginner :) God bless you and more power. If you freeze cookie dough unbaked, there is no taste difference in terms of freshness. In fact, frozen cookie dough tends to taste better, because the flavors have had time to meld. I would make a batch of cookie dough a night, portion it out, freeze it, and then bake them as your back can handle it. So glad you found it helpful, Celia! Thanks so much for stopping by!